How do I determine how many people my boats can carry, how much weight? The Maximum safe load and the persons capacity that a boat can carry is based on the displacement weight of a boat. What is displacement weight? That is essentially the amount of weight that it would take to sink your boat. There are several ways to find this out. 2. Or put weight in the boat until water starts to come in. This sounds simple but is difficult for the average boat builder because it requires a lot of weight. The amount of weight can be considerable. On a larger boat it can be 10,000 lb. or more. The amount of weight it takes to sink the boat is the displacement weight. If you want to do it this way hire a test lab or call the Coast Guard. See the flotation page for information about free testing. Slide Show of a boat being tested for Maximum Weight Capacity has been deleted from this page. 3. Or with smaller boats fill the boat with water using a bucket of a known amount. Fill it until the level of the water in the boat and outside the boat is equal, that is when water starts to flow in and out of the boat. Multiply the number of gallons times 8. That gives you the displacement weight. Inboard and Stern-Drive Boats under 20 feet. Maximum Persons Capacity = W; or for boats with W less than 550 use the test method. 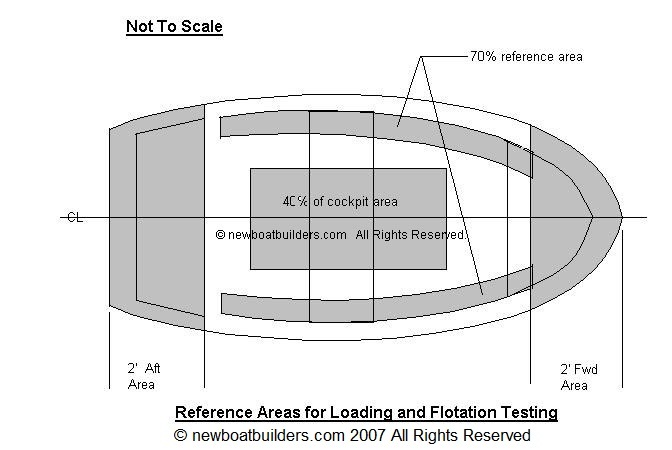 Test Method: float the boat in calm water with all the normal gear aboard, that is, engines, batteries, controls, etc. Add weights along the outboard side of the passenger area . The weight should be at seat height and distributed equally for and aft. Add weights until water is about to come over the gunwale. Stop. Add up the weight. Maximum Persons (in people) = (Maximum Persons Weight + 32)/141. Round up or down. A bit of advice. Maximum persons capacity doesn't have to be the maximum amount, it can be less. Smart boat builders down rate the maximum weight and persons capacity to cover liability and all that other heavy junk people carry on to their boat like coolers full of beer, extra gas, the spare fish finder they just have to have, the ski-boards and slalom skis, etc., etc. REMEMBER! The boat operator will exceed whatever you put on the label and then blame you if something goes wrong! Be conservative. Give yourself some room. Outboard Boats under 20 feet rated for greater than 2 HP. Outboard boats under 20 feet, 2 HP or less. The same warning applies to Inboard boats. Be conservative. Error on the side of safety.